Just a reminder to self…. When you choose for the cover of the 2nd edition of Video Artisan, if you dare to use a picture of Tiff as you did on the cover of the 1st edition – make sure you ask her permission first! Apparently there should have been a wardrobe, make up and hair session before this was approved! I think she looks fab regardless! Subscribe to my blog and you’ll get something for nothing! 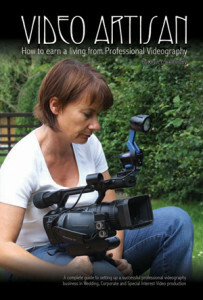 For some time now I’ve been working on the 2nd edition of my book – ‘Video Artisan – How to earn a living from videography’ which was published way back in 2007. Though the bulk of its contents are still relevant today it is in need of an update. There are lots of things that I’ve learnt in the past five years that simply must be included in the next edition – but its not going into print. Video Artisan 2 will be published here – as a regular blog. As an additional incentive all new subscribers to my blog will be emailed a free PDF copy of the 1st edition – so get subscribed now! Gym joined. What have I let myself in for??? Whilst shooting video (in most cases) is not exactly hard labour, I don’t want to be doing any heavy breathing whilst on a shoot. I’m not aiming for that kind of work! Have covertly released the main website today. When I say covertly I really mean just starting to let news of it trickle out. Started off my Facebook and Twitter pages too. Gotta let the world know about Video Artisan as it soon going to have to start paying the bills!!! Oooh errr! Short and sweet – but this is my first blog for the Video Artisan WordPress site.